Home / Movies / Visionary Director Takes You to the Haunted World of "Crimson Peak"
Visionary Director Takes You to the Haunted World of "Crimson Peak"
As the writer and director of such modern classics as “The Devil’s Backbone” and “Pan’s Labyrinth” and the producer of such terrifying thrillers as “The Orphanage” and “Mama,” del Toro delivers a unique blend of psychological terror and operatic beauty that has propelled horror into the elevated realm of dark fairytales. With his new film, this powerful force of imagination makes a grand return to the genre he helped define. Here, del Toro creates an elevated romance with a level of cinematic artistry that harkens back to the genre’s greatest triumphs, while delivering spectacular visuals, rich characters, emotive performances, and a story that grips you to the bitter end. Set in the year 1901, “Crimson Peak” is given a stylized, contemporary gothic feel through del Toro’s mesmeric visual style. Audiences will be swept away to a terrifying destination like no other, where the snow bleeds red and every corner hides a phantom that will linger in the mind long after the film is over. 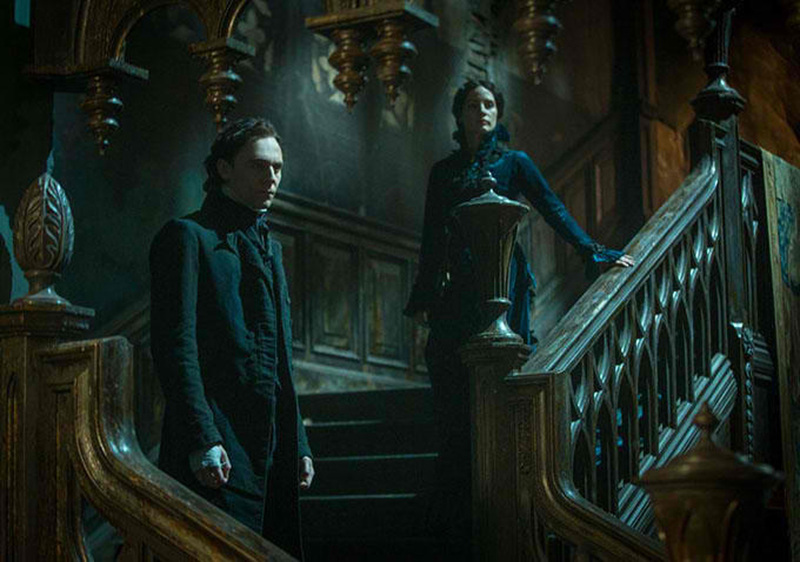 “Crimson Peak” explores the haunting theme that love is indeed a tender trap. Just as the events of “Pan's Labyrinth” could be questioned by audiences as the product of a young girl’s limitless fantasy, “Crimson Peak” plays with our perceptions of what is truth and what is fiction. As Edith is a burgeoning writer with a vivid imagination, could the terrifying events all be springing forth from her mind? For del Toro, material exploring this genre can have ghosts and crumbling castles and “it can have the trappings of a horror film” but intricately seeded is a classical love story in which a central “virginal character who is discovering a secret, a treasure, a dark past…emerges somewhat transformed.” And in spite of the dark turns the love story takes, the budding romance between Thomas and Edith has a lyrical quality. Still, if love is a form of madness, all of the key players in their story fall victim to it. What attracts del Toro to bring terror into his work is “using ghosts to eliminate human antidotes, to illuminate the story in a human way.” He took the classic gothic romance and infused it further with his imaginative approach by building a unique haunted mansion that became the mortar of the mystery. Here, fear lives within the walls.